For compositions titled "Piano Sonata", see Piano Sonata No. 1 (disambiguation). Other composers of keyboard sonatas (which were primarily written in two or three movements) include Marcello, Giustini, Durante and Platti. Although various composers in the 17th century had written keyboard pieces which they entitled "Sonata", it was only in the classical era, when the piano displaced the earlier harpsichord and sonata form rose to prominence as a principle of musical composition, that the term "piano sonata" acquired a definite meaning and a characteristic form. All the well-known Classical era composers, especially Joseph Haydn, Muzio Clementi, Wolfgang Amadeus Mozart, and Ludwig van Beethoven, wrote many piano sonatas. Muzio Clementi wrote more than 110 piano sonatas. He is well known as "The Father of the Pianoforte". Clementi's Opus 2 was the first real piano sonata composed. The much younger Franz Schubert also wrote many. The 32 sonatas of Ludwig van Beethoven, including the well-known Pathétique Sonata and the Moonlight Sonata, are often considered the pinnacle of piano sonata composition. As the Romantic era progressed after Beethoven and Schubert, piano sonatas continued to be composed, but in lesser numbers as the form took on a somewhat academic tinge and competed with shorter genres more compatible with Romantic compositional style. 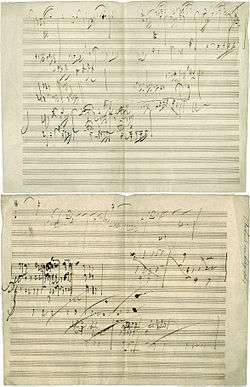 Franz Liszt's comprehensive "three-movements-in-one" Sonata in B minor draws on the concept of thematic transformation first introduced by Schubert in his Wanderer Fantasie of 1822. Piano sonatas have been written throughout the 19th and 20th centuries and up to the present day. Piano Sonata No.4 in E-flat Major, Op.7 "Grand Sonata"
Piano Sonata No.12 in A flat Major Op.26 "Funeral March"
Piano Sonata No. 18 in E flat major, Op. 31 No. 3 "The Hunt"
Piano Sonata No.25 in G Major, Op.79 "Cuckoo"
Piano Sonata No. 29 in B Flat Major, Op.106 "Hammerklavier"
Piano Sonata No. 1 in F-sharp minor, Op. 11 "Grosse Sonate"
Piano Sonata No. 3 in F minor, Op. 14 "Concerto without Orchestra"
Piano Sonata No. 1 "Reflections on Exile"
Piano Sonata No. 2 "The Last Resistance"
Piano Sonata No. 1 in A Major "Der Main"
Piano Sonata No. 2 "Sonata-Fantasy"
Piano Sonata No. 7 "White Mass"
Piano Sonata No. 9 "Black Mass"